When I was in college studying Geology, in my hometown in Patras, Greece, I was fortunate to have a great professor that taught us Marine Geology. He gave me the opportunity to join him in a survey his group was doing during the summer break, in the Ionian Sea, western Greece, just off the island of Kefallonia. That was my first meeting with Marine Geology and I was hooked forever, I found my calling. After my bachelor’s I left Greece and went to study Oceanography in Southampton at the National Oceanography Centre. I then discovered I loved it enough to do a PhD, so I stayed and that’s when my interest in submarine landslides was forged. Since then I have studied several submarine landslides, mostly in the Atlantic and the Mediterranean Sea. Now I live in Ireland and I am a lecturer at the School of Earth Sciences, University College Dublin, and thanks to the Geological Survey of Ireland that believes in IODP and its program, I was given the opportunity to travel to the other side of the world to study submarine landslides in the Pacific Ocean, offshore New Zealand! 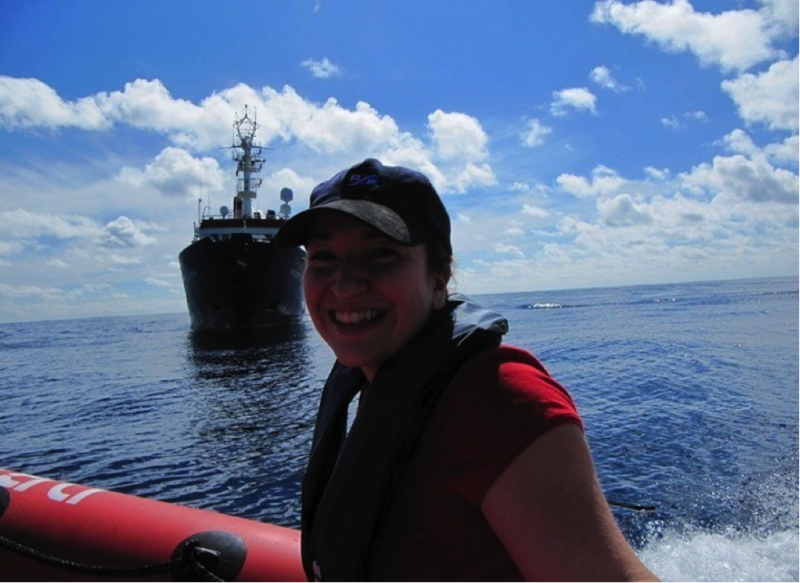 I’m participating IODP Expedition 372 as part of the Sedimentology team. Sedimentology is the study of mud and sand in nutshell. You might wonder, how does this relate to submarine landslides? Well, every submarine landslide is different I’ve discovered and that’s why I love them, they never bore me! But what they have in common is that they are made up of mixtures of sediments of all sizes and in all patterns. Remember when you were a child and played with plasticine and you took sticks of different colours and you tried to mix them? When you first pushed them together they created streaks of colours but you could still make out the individual colours. But as you kept moulding them and pushing them together they ended up mixing and eventually they started getting a uniform colour. Submarine landslides look a lot like that. A large chunk of a slope that is made of layers of different sediments, often with different colours too, collapses down the slope and tumbles down until it finds a flat surface and there it stops. It settles there and now there is a landslide deposit. When you look inside it, at different parts of the slide, you may find areas where you still have some of the original layers, but they will look like the different coloured streaks of your plasticine, and in other areas, where the material mixed well because of the tumbling, it may look uniform. In both cases it won’t look “quite right”, it won’t look layered and structured, because a lot of mixing and deformation has taken place while it slid. And it’s not just the sediment that mixes; these things flow in water and have water within them too, so the water helps with the mixing. The more vigorous the tumbling, the more water will get in and the better mixed the deposit will end up being. Cores of sediments, which are long tubes that we take from the seafloor and below it, allow us to look at these deposits, look at the patterns inside them, take samples and measure the sizes of the grains and understand what happened after the slope became unstable and collapsed. We can also look at what is underneath the slide and see what it was riding on, and try to work out what makes that surface so special that it became a sliding surface. Why do we care? For one thing, we care about the Science, it’s that innate human characteristic of curiosity that has driven humanity into sciences and the constant search for understanding how our planet works. There is so much we don’t know about processes that take place under the surface of the ocean and on our seafloor, particularly in the deeper water. For another, submarine landslides can be very catastrophic events and when a huge bit of a slope moves through water, it pushes it out of the way; the water has to go somewhere, so we could get tsunamis. There have been tsunamis caused by submarine landslides in many parts of the world throughout human history and geological history. Not all submarine landslides cause tsunamis and it is important for us to understand which ones did and why. We can then look at the slopes offshore our coastlines and try to prepare better for this geohazard that is so poorly understood. And lastly, we all like playing with mud and sand, don’t we? 1 meter from a core in the Mediterranean. See all the layers with the different colours? Me on a test drive of the MoB (man overboard) of RV Poseidon, and the research ship itself behind. Somewhere in the Atlantic, south of the Canary Islands. Kia ora koutou! My name is Erin Todd and I'm a researcher at the University of Otago studying earthquakes in New Zealand with a passion for science communication, education, and outreach. I got my bachelor's degree in geosciences at Penn State University and my PhD in seismology at the University of California Santa Cruz. When I'm not studying earthquakes, I love teaching about Earth science at local schools and in the community. I also design and develop Earth science curriculum for online courses. I love making science fun and accessible to everyone! Ngā mihi!